The Tariqa, the Way of the Prophet Muhammad is one. It is the same way as that of Abraham, Moses and Jesus. The way of the Shadhiliyya is the straight way. You do not need many months or many years; but one hour is all that is necessary to know the Tariqa and to know your God. All of you come as children to Him. Muhammad, upon him and to all divine messengers be holy benediction, is the 'insan al-kamal and through him all the knowledge (ma'arifa) from Adam until now is ours because the truth is within our hearts. This is the way of the "Muhammad of the time" or the "Jesus of the time". He is the Prophet of the Holy Light (Imam al-Huda). This Way is the way to know God. The Tariqa Shadhilliya is the way of the person who forgets all things and returns back to the truth as in the beginning; a child in the Presence of God. You can not see more than Him or hear of any other place. You cannot speak without Him. You are with God, in God, to God in the origin of all things. You are in this station and this station is in you; fana al-mutlaq (annihilation in the freedom of God); the start which has no start; the end which has no end. The knowers are the inheritors of the prophets." "In my community there will be my elect followers who will have status equal that of the Prophets from the Bani Israel (Children of Israel)." Beloved, know in whose presence you sit; know who whispers these words into the ear of your heart. You will see me with the eyes of your deepest yearning, if you see me at all. If you understand what I mean then let us meet face to face, hand to hand, soul to soul. Know that the perfect slave is one with his Lord and he is like one immersed in a great Sea who doesnt swim through the Sea by his own effort or intention but is borne with the Sea and is one with the Sea. Many fathomless currents and hidden pearls are contained within the depth of the Sea; so vast and limitless is the Heart of the guide because at once he is in the Sea and the Sea is in him. When you look into the face of the guide, what do you see? You see yourself. If you come to the Ocean with a cup, you drink by the cupful; if you come with a teaspoon your spoon will be filled. If you enter and dissolved in the Presence (fana-fi-shaykh) then you see truly, without limit, beyond form, who you are facing and who you are whom he faces. Beloved, know that the guide is the holy bride who wants to wed you but only her Beloved within you can truly embrace her. The bride is your Own Original Truth which remains virgin, beneath the veil of every presence. How do you become, or realize the holy being that you are, for whom the guide has manifest to reflect? Search about yourself, my beloved, and know yourself well. What you truly long for, ask for, so that you may receive it. Call to me from your inner depth, so that I may meet you in that depth from which you call. Again I say, drink and surrender; you take from this Sea what you give to this Sea. Sidi Shaykh Muhammad Sa‘id al-Jamal ar-Rifa‘i ash-Shadhuli, the Guide of the peace, the mercy, and the love to the way of Allah through the Sufi path a guide of the Shadhdhuliyyah Tariqah. The Shaykh is a descendant of the Prophet Muhammad, may Allah’s peace and blessings be upon him, through his ancestor, Shaykh Ahmad ar-Rifa‘i. He was born in Tulkum in the Holy Land in 1935. 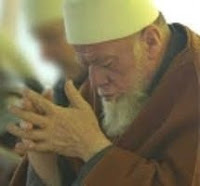 He is the spiritual inheritor through the Shadhili line from his Guide and Master, Shaykh ‘Abdu-r-Rahman Abu-r-Risah of Halab in the land of Syria. In 1997 he restored the 1000 year old Sufi Council that served in the Holy Land. He is the Head of this Council in Jerusalem and the Holy Land and has been a teacher and central figure at the Masjid al-Aqsa or the Dome of the Rock for many years. For many years the Shaykh has been a teacher at the sacred sanctuary of al-Aqsa in Jerusalem. Not only is he a teacher and counselor for all those who come to be at al-Aqsa, but he is also its custodian, for through his hand and leadership in these times this Sacred Precinct has been preserved, in the face of many efforts to destroy it, as a place of prayer for the Muslim people who come from all over the world to visit the Holy City of Jerusalem and to take the blessing of the praying in this Mosque. The Shaykh has students and followers in the Holy Land as well as in America , Africa and Europe, but it has only been since 1993 that the order came to his heart to travel to visit other countries. At the same time the order came from Allah for him to give teachings to all those in every part of the world who are sincerely seeking for the truth of their existence, the meaning of their life, and to heal their wounds. Up until then, the teaching had been reserved only for study in his Zawiyah in Jerusalem. Sidi opens his heart to help everyone from any country or nationality and any spiritual / religious background. He began his career at a very young age as an uncompromising man of God, who had no fear of anyone but God, and because of this took a stand facing governments any time they tried to overlook God in their actions or disrespected people’s right to worship God. Being a judge of the courts, he was a government employee, at the same time that he gave weekly sermons in al-Aqsa mosque in Jerusalem. He has been the spiritual counselor to the people of the Holy Land and to all those who have visited over the past forty years and has given his life as a sacrifice to this work. He makes monthly journeys all over the Holy Land to help the poor and to make sure that everyone has food and clothing. There are always lines of people at his home and at his office because they know that they can find real help from him. The Shaykh opened a Sufi Center in an old building on the road to Jericho which holds the Prophet Moses’ tomb, may the peace and blessings of God be with him. This center became the head of the Sufi operations of aid. In 1994 he made his first visit to America and has continued to be invited here each year to give seminars and teachings at schools and centers across the United States. The Shaykh is not a teacher for a few following a spiritual path but opens his heart to help everyone from any country or nationality and he has helped people from all over the world. Its a delight that Sidi is presently in the USA visiting many cities, generously showering his teachings and giving bayat (initiation into the Tariqa) to those who seek the Way, who seek Truth. There will be gatherings and retreat with his presence in a number of states and towns in USA including Northern and Southern California, Austin, Texas and Fort Lauderdale, Florida. > Click for a PDF of the Master Schedule (including registration info). A very special retreat on the last 10 days / nights of Ramadan will be held from September 10-20, 2009. During this retreat, the Mother Center at Pope Valley (Near Sacramento) California will host Sidi Muhammad al-Jamal and Shaykh Abdullah Nooruddeen Durkee. Sidi’s visit will include Lailat al Qadr (the special night of blessings and revelation) which will be on Wednesday, September 16th, Inshallah. The retreat will end with Eid celebration, possibly on September 20th. Places are limited. So pls consult registration info for details and contact the numbers therein if you intend to receive the blessing of sitting with the guide. When the seeker is ready, the master appears.